Glutathione precursor (extremely powerful antioxidant). Associated with slowing the aging process. Prevents side effects of medications, chemical products, cigarette smoking, and noise. Is particularly effective at preventing colds, flu, smokers' cough and bronchitis, and more generally, pulmonary disorders associated with the accumulation of mucus. Is an effective antidote against paracetamol poisoning when administered within twelve hours. 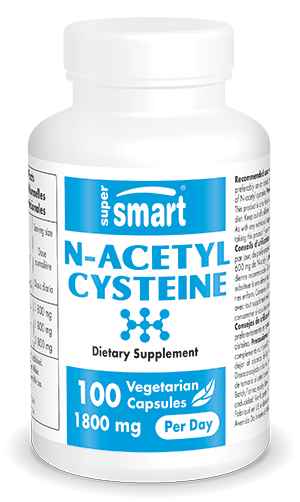 N-acetyl cysteine is a powerful, low-cost, pluri-potent and scientifically-supported antioxidant which anyone wishing to reduce age-associated oxidative stress should include in their daily supplementation. To maintain or restore glutathione levels in the body, discover our perlingual glutathione supplement . Studies show that glutathione deficiency can also be prevented by the effects of R-alpha-lipoic acid. Along with N-acetyl-cysteine, other active principles, including the neurotransmitter precursor dimethylaminoethanol (DMAE) , can also promote the synthesis of active molecules. Other ingredients: maltodextrin, rice flour. Each vegetarian capsule contains 600 mg n-acetyl-cysteine. Recommended use: Take between one and three vegicaps a day, preferably on an empty stomach, or as advised by your therapist. It is strongly recommended to take double or triple amounts of vitamin C at the same time to recycle the glutathione and keep it in its reduced form.